Are 11" netbooks the new 10"? 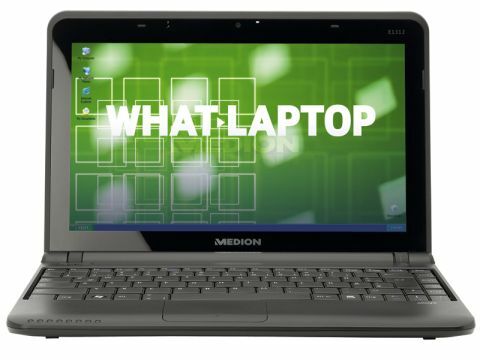 The Akoya Mini E1312 is Medion's largest netbook and features the rare but increasingly popular 11.6-inch screen size. This makes it a very comfortable netbook to use and it is certainly worth a look for those in the market for a larger machine. The 11.6-inch screen size is increasing in popularity, as it strikes a good balance between 8.9 and 12-inch panels. The screen here provides great colour reproduction and the most detailed image available on a netbook thanks to the 1366 x 768-pixel resolution. The thin bezel allows the panel to stretch almost the entire width of the machine. The keyboard is sunk far into the chassis and this makes some keys difficult to strike. This is especially the case with the spacebar and we repeatedly brushed the touchpad attempting to hit it. The keyboard isn't well-mounted either, and the typing action is very spongy as a result. Like the keyboard, the case is a little flimsy. It is built from matt-black plastic and provides basic protection, but we can't see it surviving a serious bump. Instead of the usual Intel Atom processor, the E1312 boasts an AMD chip. Office performance is good, and basic multi-tasking is not a problem, but as soon as more resource-intensive applications are launched, it slows down significantly. Mobility is reasonable, with its 1.5kg weight proving easy to carry around regularly, although the 180-minute battery life means it may be necessary to take the charger with you. Wireless connectivity is great, with 802.11n Wi-Fi providing the fastest wireless connections currently available when in range of hotspots. Three USB ports provide plenty of room to add peripherals. An ExpressCard slot lets you add extra enhancements internally and, alongside the analogue VGA-out, there's an HDMI port for connecting to high-definition monitors. While the Akoya E1312 has one fault in its keyboard, which takes a while to get used to, this is an otherwise excellent netbook with a host of useful features.